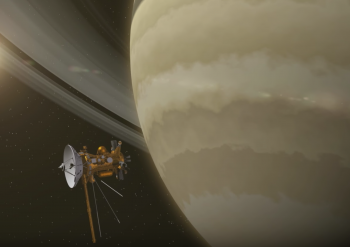 Nearly 20 years after launch and almost 13 years at the majestic ringed planet, the Cassini spacecraft is about to enter the final phase of its historic mission. The Grand Finale of Cassini’s mission began Sunday morning, setting up a series of close-proximity ops to the planet as Cassini dives between the innermost edge of Saturn’s rings and the planet itself to prepare for atmospheric entry into Saturn and the end of its mission on 15 September 2017. The grand finale to Cassini’s mission began at 03:46 GMT on 23 April – 23:46 EDT on 22 April) when the spacecraft reached aposaturnium, the farthest point in its orbit of Saturn – which marked the commencement of the first of the final 22 orbits of the craft. 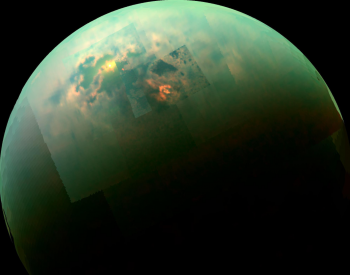 The commencement of the grand finale was aided days earlier by the spacecraft’s 126th and final close flyby of Saturn’s moon Titan on 22 April at 06:08 GMT (02:08 EDT). This trajectory shift will bring Cassini to its first Grand Finale ringplane crossing as it dives between the inner-most ring and the planet – the first time any spacecraft has attempted such a feat – on 26 April at 09:00 GMT (05:00 EDT). This will be the first of 22 weekly ring crossings for Cassini in the final five months of its mission. During this first ringplane crossing, Cassini’s orientation will allow the craft’s High Gain Antenna to act as a shield to protect the instruments and the spacecraft from possible ring particle impacts. Moreover, the trajectory of each of the 22 ring crossing orbits is not identical, as each is specifically designed to allow Cassini to investigate different aspects of the planet and its rings as the final weeks of scientific data are collected. Overall, the grand finale to Cassini’s mission carries unique mission objectives, including: detailed mapping of Saturn’s gravity and magnetic fields to reveal how the planet is arranged internally and to potentially solve the mystery of how fast Saturn is rotating; to improve knowledge of how much material is in Saturn’s rings and to help better understand and reveal their origins; to sample the icy ring particles being funneled into the atmosphere by Saturn’s magnetic field; and to take close-up images of Saturn’s rings and upper atmospheric clouds. 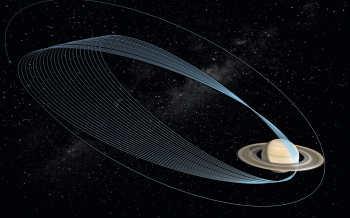 To successfully complete these mission objectives, the final 22 orbits will see Cassini’s distance from Saturn differ greatly, with some orbits allowing the spacecraft to skim the outer edges of the atmosphere while others will take the spacecraft farther out to skirt the very inner-most sections of the ring system. The farthest into one of the rings Cassini will go will occur on the 6th ring crossing on 28 May. During this passing, Cassini will sample Saturn’s innermost ring, the D-ring, while being shielded by its high-gain antenna. 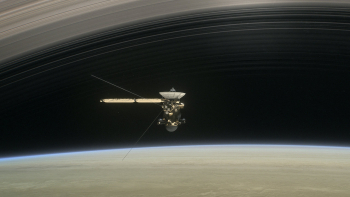 This will be followed by a second close venture into the D-ring on 4 June that will again allow Cassini to sample the D-ring material. A third venture into the D-ring will then occur on 29 June followed by the fourth and final ring dive on 6 July. On 14 August, Cassini will begin the first of five dives into Saturn’s atmosphere, sampling the gas giant’s atmosphere for the first time in history. The first atmospheric sampling dip will occur on the 18th orbit of the grand finale mission. Orbit 19 will see another dip into Saturn’s atmosphere, while orbit 20, on 27 August, will see the third and lowest of the dips into the atmosphere. Orbits 21 in orbit 22 on 2 September and 9 September, respectively, will see the fourth and fifth dips into the atmosphere. After this, on 11 September, Cassini will perform a final, distant flyby of Titan that will give the spacecraft just enough of a gravitational nudge – what’s being called the “goodbye kiss” – to send Cassini into its 293rd and final orbit of Saturn. 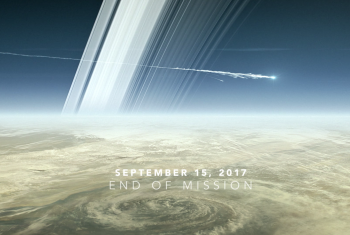 Cassini will reach its final aposaturnium on 12 September at 05:37 GMT – a moment that will mark the start of Cassini’s plunge into Saturn’s atmosphere. 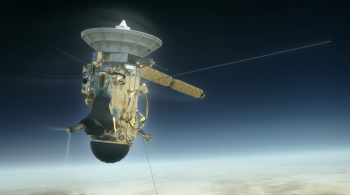 On 15 September at 10:44 GMT (06:44 EDT), Cassini’s thrusters will fire to maintain attitude control for a roughly 60 second burn that will enable the final transmission of expected mission data back to Earth. 10:44 GMT will also mark Cassini’s entry into Saturn’s atmosphere. The spacecraft, during its fiery death plunge, will be commanded to continue relaying telemetry back to Earth until the spacecraft’s destruction. Based on atmospheric entry parameters, the last signal from Cassini is expected to be transmitted from the spacecraft on 15 September 2017 at 10:45 GMT (06:45 EDT). The signal is expected to arrive at Earth through the Deep Space Network 1 hour 23 minutes later at 12:08 GMT (08:08 EDT). It was a mission slated to last only four years. Following a flawless launch from the Cape Canaveral Air Force Station aboard a Titan IV (401) B rocket, Cassini spent seven years performing multiple gravity assist maneuvers and flybys of various planets before entering orbit of Saturn on 1 July 2004. Even its arrival at Saturn was daring. To insert Cassini into the proper orbit, mission controllers had to fly the vehicle through the gap between the planet’s F- and G- rings, something that caused a bit of concern due to the relatively unknown nature of how debris-free the ring-gap was. 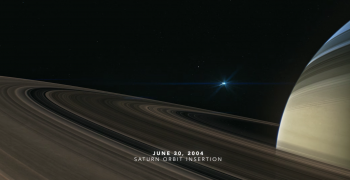 Despite the fears, Cassini threaded the needle perfectly and entered orbit of the ringed planet for a mission that, at that point, was scheduled to end on 30 June 2008. 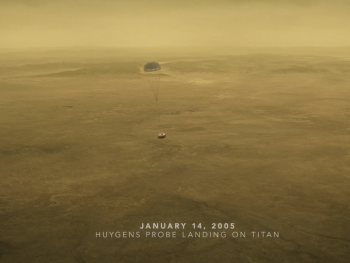 On 14 January 2005, the Huygens lander successfully entered Titan’s atmosphere, performing a 2.5 hour descent via parachute and subsequent landing on the surface of the moon. The Huygens landing remains to this day the most-distant landing of a human-built craft and the only landing thus far attempted in the outer solar system. Huygens functioned for 90 minutes after landing, returning images and scientific data of the landing site near the Xanadu region. While Huygens touched down on land, the possibility of a methane lake landing was accounted for in its design. On 15 April 2008, Cassini received the 27 month mission extension for 60 additional orbits of Saturn, 21 close flybys of Titan, and seven close encounters with Enceladus. The extended mission was named the Cassini Equinox Mission and allowed the spacecraft to observe Saturn’s transition through Equinox, which occurred in August 2009. The first mission extension came to an end in August 2010 and was succeeded by a second and final extension – a seven year mission extension out to the maximum operating time for Cassini based on its RTG (Radioisotope Thermoelectric Generator) power source. The mission was subsequently named the Cassini Solstice Mission as it would allow Cassini to monitor Saturn’s transition through the solstice, which will occur on 24 May 2017. The solstice mission allowed 155 more orbits of Saturn, 54 additional flybys of Titan, and 11 more close encounters with Enceladus. Throughout the course of its nine and a half years of mission extensions, Cassini has helped unlock startling revelations about Saturn, Titan, and Enceladus. 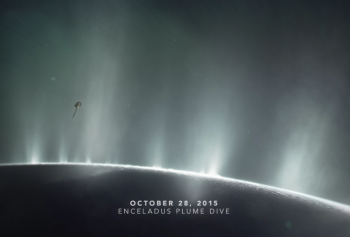 Chief among Cassini’s discoveries regarding Enceladus was last week’s ground breaking announcement of the discovery of possible life-supporting hydrothermal vents on the surface of Enceladus’ subterranean salt-water ocean. In 2015, when Cassini flew within 48.3 km (30 mi) of the surface of Enceladus, the craft flew through the moon’s southern cryo-geyser ejecta plumes. During this pass, Cassini’s mass spectrometer positively identified hydrogen particles that were later determined to have originated from hydrothermal activity beneath Enceladus’ surface. The presence of ample hydrogen in Enceladus’ ocean provides evidence for a life-supporting habitat on the ice moon as any microbes that might exist in the ocean could use the hydrogen to obtain energy via the combination of hydrogen with carbon dioxide dissolved in the water. This chemical reaction, methanogenesis, is what first sparked the development of life on Earth. Now, as Cassini’s mission prepares to come to an end, data from the spacecraft continues to cement Enceladus – at least for now – at the top of the list of places in the solar system where life holds a significant chance of existing.